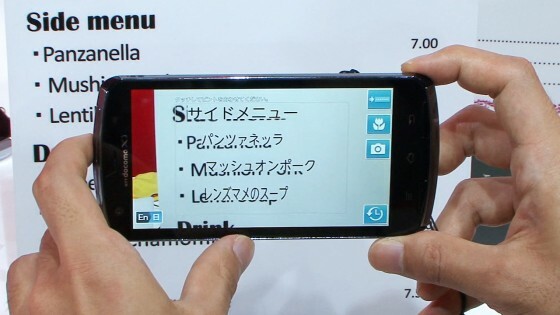 On October 11, NTT Docomo will start the Utsushite Honyaku service, which instantly translates foreign-language restaurant menus when you point a smartphone’s camera at them. Utsushite Honyaku is a commercial version of a service that’s been available as a trial version. As well as menus, the new service can now handle signs. It works between Japanese and four languages: English, Korean and both simplified and traditional Chinese. The user can choose two translation modes. In one mode, the whole translation is superposed on the actual picture, and in the other, it’s shown line by line in a separate window. This service can also translate from Japanese into the four languages. So, it’s helpful not only for Japanese Docomo users, but also for foreign Android smartphone users visiting Japan.